Subtle signs of early disease, including redness, make it difficult to detect a problem at home until the disease is more advanced. 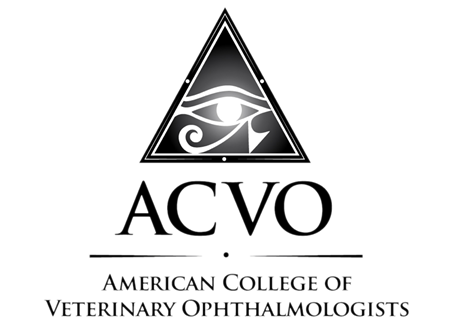 A veterinary ophthalmologist can detect pigment on the lens and uveal cysts (fluid-filled structures behind the iris) as the earliest signs during the ophthalmic examination. The significance of uveal cysts is still being investigated, but a relationship between the cysts and development of glaucoma has been documented. Over time, signs can progress to pigment on the corneal endothelium (inside of the cornea), posterior synechiae (adhesions), fibrinous material in the anterior chamber, cataract in the lens, and eventually glaucoma (elevated pressure inside the eye). The prevalence of this disease among Golden Retrievers in North America is estimated to be between 5-10%. Most dogs diagnosed are over the age of 5 years, and the average age at the time of diagnosis is 8-10 years old. Unfortunately the overall prognosis for the eyes is guarded with many eyes becoming blind due to glaucoma. Glaucoma is a painful disease in which the pressure inside the eye increases and causes damage to the structures responsible for vision. Elevated intraocular pressure results in the clinical signs that you may have noted at home (cloudy eye, redness, squinting). The longer the pressure in the eye is elevated, the more damage occurs to the structures in the eye responsible for vision, eventually resulting in permanent blindness. 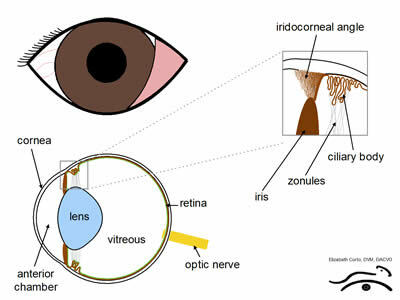 In a normal eye, fluid is constantly produced by the ciliary body and drained out the iridocorneal angle (also called the drainage angle). The iridocorneal angle has a net-like meshwork with large spaces through which the fluid flows. Secondary glaucoma is caused by obstruction of drainage of fluid from the eye through the iridocorneal angle. Glaucoma is unfortunately difficult to treat and not all cases can be resolved. The goals of therapy are to maintain a normal intraocular pressure and treat the underlying cause of the glaucoma. Unfortunately, due to the nature of the disease many animals lose vision despite treatment. For blind, painful eyes permanent resolution of glaucoma is recommended via enucleation (removal of the eye), intrascleral prosthesis (replacing the contents of the eye with silicone), or chemical ciliary body ablation (destruction of the ciliary body with an intraocular injection). Not all options are appropriate for every patient and here are pros and cons to each of these treatments, which we are happy to discuss.